The ash created when fossil fuels and bio-fuels are burned can be re-utilised in ground construction work such as roadways, recreational areas and general landscaping. It can be used in place of depleting and expensive natural resources. Because the ash by-product is recycled back into use, the energy producer’s environmental footprint is lightened, and costs and taxes associated with landfill disposal are avoided. We help energy producers to turn waste by-product into profitable, sustainable business. The re-use of ash in land construction requires that a whole new business activity model be formed. Tightening environmental requirements and laws require power stations to re-use and recycle the by-products of their combustion processes. Disposing of ash in landfill sites creates extra costs. A stabilised ash mix can be used as an alternative ground construction material or safe landfill. Worthless waste ash becomes commercially valuable material, offering a viable alternative for contractors working on landscaping, municipal construction and other such projects. By creating new product from by-products, costs and taxes are turned into profit. The unnecessary environmental burden of landfill disposal is minimised. Re-using by-products means saving natural resources, and the new construction material offered by power stations is often closer than the local quarry, meaning that expensive, noisy and polluting truck traffic is lessened. The use of these new materials has been studied extensively, and they have proven to be safe in use. A guidance and monitoring system has been created to help customers. Tecwill has developed the Cobra and Arcamix model for stabilising different types of mass, ash and problem waste. 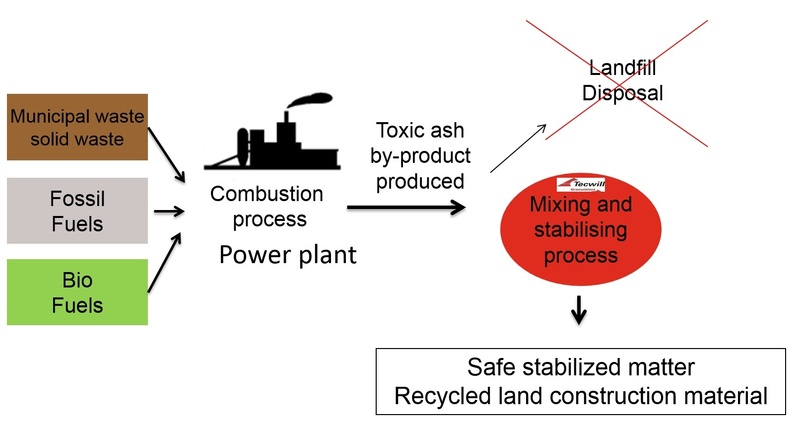 Ash is mixed with suitable additives and binding agents, and other industrial by-products if required, to create a safe material. Cobra and Arcamix represents a new way of thinking in mixing and stabilising. The mixing station is constructed completely at the factory and delivered ready to use.